The Czech-designed Panzer 38(t) armored vehicle was used extensively by German panzer divisions. Poland, the Netherlands, France, the Balkans, and Russia were subjected to Germany’s blitzkrieg between 1939 and 1941. At the forefront of those assaults were tanks of Czechoslovakian design. In March 1939, what was left of the Czechoslovakian nation was absorbed into Adolf Hitler’s Third Reich. Included in the newly acquired loot was a cache of about 470 armored fighting vehicles. Some were state-of-the-art for their time, while others were outdated and useless. Even before the conclusion of the Great War of 1914-1918, Bohemia, which became part of postwar Czechoslovakia, was already known for its established and well-respected arms manufacturing industry. Centered at Pilsen, west of Prague, the Skoda Company had built—for export as well as home consumption—an entire array of artillery and aircraft that was soon followed by an output of automobiles. 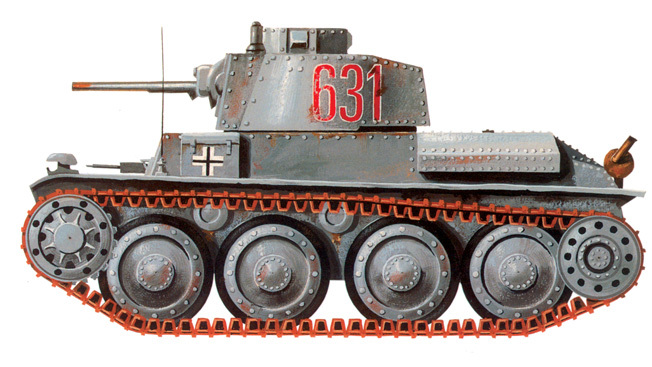 The Czech-designed Panzer 38(t) saw extended service with the German Army during WWII. The chassis was also used in other vehicles including self-propelled assault and antitank guns. By 1927, a competing arms interest had developed in the country. Comprised of the Praga Car Company, the Tatra Auto Works, and two smaller firms, the conglomerate CKD (Ceskomoravska Kolben Danek) was born. Between Skoda and CKD, and with easy access to high-grade iron ore, the newly formed nation-state was in an excellent position to manufacture its own tanks and armored fighting vehicles. Immediately after the establishment of the state of Czechoslovakia, the Czechs filled their need for tanks by purchasing a small number of Renault FT models from France. By the mid- 1920s, the government felt the need to have a more secure source of armored vehicles than those of foreign purchase. Skoda was more than willing to become that source. In 1925, the company, in conjunction with the Tatra Auto Works, was designing and selling armored cars to the Czech Army, so it was a natural step for Skoda to go into tank production. The first designs were the wheeled and tracked KH60 and KH70, both small, two-man crewed tankettes produced between 1929 and 1930. Soon CKD came out with its own tankette, the T33, for which the Czech government awarded a contract. In 1934, CKD produced the LT34 light tank and sold it to the Army. The next year Skoda introduced its version of a light tank, the LT35. Built in cooperation with CKD, the new vehicle weighed in at 10.5 tons, was 15 feet long, had wide tracks, and was covered with 25mm of frontal and 16mm of side armor. It sported a Skoda A3 37mm cannon and two 7.92mm machine guns. Its four-man crew could maneuver its charge at a maximum speed of 21 mph with a range of 120 miles. Unfortunately, the LT35, which was accepted by the Army in 1936, had two serious problems. Its pneumatic steering and gear change systems tended to seize up in cold conditions. Second, the extensive use of rivets in the hull construction caused a storm of flying metal to fill the crew compartment when the tank was hit by enemy fire. Regardless, some 298 of these tanks were in service with the Czech Army in 1938. To address the mechanical deficiencies of the LT35, CKD and Praga developed the TNHP. This new model was an upgraded version of their LT35. Steering was improved by replacing the unreliable pneumatic system found in the LT35. Suspension was improved with the use of four large elliptically sprung, rubber-tired road wheels. The six-cylinder 120 hp engine was increased to a 125 hp Praga engine, allowing the machine to travel at about 25 mph. Its road range and off-road mileage were 120 and 84 miles, respectively. The new 9.5-ton tank was fitted with a Skoda turret armed with an A7 37.2mm (47.8-caliber) gun. This weapon, an improved version of an original Skoda antitank gun of the same caliber, proved to be both powerful and accurate. Two 7.92mm machine guns were retained, as well as the need for a four-man crew. Designated the LT38, it became the main Czech armored fighting vehicle. An order of 150 was placed with Skoda in 1938, but due to the restrictions imposed upon the Czechs by the Munich agreement of that year, only about 80 ever saw service with the Czech Army. Under the Germans, the design would become a formidable and dominant light to medium tank in the first three years of World War II. In the spring of 1939, the German Army integrated all the serviceable LT35s, about 200, into its light divisions, intermediate organizations combining light tanks with motorized infantry. These light divisions were primarily outfitted with the thinly armored, machine-gun-carrying PzKpfw I (Panzerkampfwagen) and equally thin-skinned 20mm gun-toting PzKpfw IIs. The TL35s, renamed by the Germans as the PzKpfw 35(t), gave the light divisions a tremendous increase in combat power. The “t” stood for tchechoslowakisch, meaning of Czech origin. By May 1939, the Germans had received the balance of the TL38s, now termed PzKpfw 38(t) Ausf (model) A, which had been part of the original order from Skoda for the Czech Army. Soon after, as a result of favorable field trials, the Wehrmacht ordered the production of 325 additional such vehicles. All would be almost identical to the initial Czech design. The PzKpfw 38(t), which the Wehrmacht placed in its light divisions in the following three months, proved a very potent weapon and soon earned the admiration of its crews as Robuste Fahrzeuge (durable vehicles). During the Polish Campaign, about 202 PzKpfw 35(t)s and 98 PzKpfw 38(t)s were employed, a total of 118 35(t)s in the 1st Light Division, 30 38(t)s in the 2nd Light Division, and 60 38(t)s with the 3rd Light Division. Out of these, only six 35(t) tanks were lost in combat, with no loss of 38(t)s reported. During the short conflict with Poland, 10 percent of the Wehrmacht’s panzer strength was composed of Czech-designed tanks. For the French Campaign of 1940, the light divisions were replaced by full-blown panzer formations (the 6th, 7th, and 8th Panzer Divisions). A total of 106 35(t)s and 228 38(t)s saw service. Models B and C of the 38(t) were widely used in the 7th and 8th Panzer Divisions. These were only slightly altered from the original model by the addition of a driver’s curved plate, the installation of smoke dispensers, and the German “Notek” lighting system. French armor, such as the Renault FT17, the Hotchkiss H39, and the Renault R35 light tanks, was no match for the German 38(t). 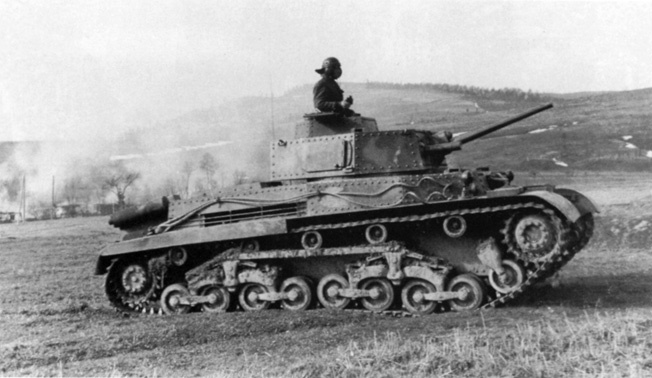 Their medium Somua S35 tank and even the heavy Char BI were outfought and destroyed by the expertly operated 38(t)s.
Following the renewal of major operations in the West on May 10, 1940, Czech-designed tanks of the German Army roll rapidly across France and toward the English Channel. Using Czech technology enabled the panzer arm of the Wehrmacht to deliver firepower and mobility to the front in the early days of the war. The conclusion of the war against France and the Netherlands saw an upgrading of the 38(t). The D model entered service in September 1940, with the E and F series appearing in November 1940. Frontal armor was increased to 50mm by riveting two 25mm plates together on all forward surfaces. The armor on the turret and upper sides of the fighting compartment was also increased. The tank’s speed was stepped up to 35 mph. Over 525 of the latter two types were produced in Czechoslovakia for the Germans between November 1940 and October 1941. Whereas production of the 35(t) was halted by 1939, the Germans not only continued making the 38(t) in different marks, but exported the tank to their allies. The main manufacturer was CKD, which became Bohmisch Mahrische Maschinenfabrik (BMM) in 1940. The 38(t)s, as well as many 35(t)s, which by 1939 had been shipped by the Czechs to foreign countries, found their way into the armies of Bulgaria, Slovakia, Romania, and Hungary. A version of the 38(t) was sold to the Hungarian government in August 1941. The new design was dubbed the Turan I and started rolling off the Skoda assembly lines in October of that year. The Turan I had a 40mm gun and a powerful 260 hp V-8 diesel engine. About 230 were built in the former Czechoslovakia and Hungary and were used to equip the 2nd Armored and 1st Hungarian Cavalry Divisions. Still in service in 1944, the Turan II was fitted with a 75mm short-barreled cannon and a modified turret; the Turan III was armed with a 75mm long-barreled cannon with a muzzle break and 105mm howitzer. The Hungarian-made Turan I was a 16-ton medium tank whose construction was based on a design from the Skoda Works in Czechoslovakia. Later int he war, its firepower would be considered negligible in clashes between armored units. In 1941, the Model D served with the 8th Panzer Division in Greece. 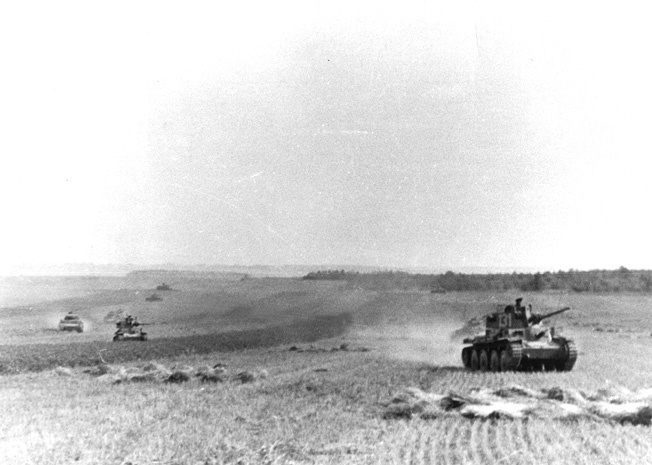 The invasion of the Soviet Union saw 38(t)s of the D, E, and F marks fighting with the 7th, 8th, 12th, 19th, and 20th Panzer Divisions. The 6th Panzer Division was still using some 35(t)s as late as November 1941. The Czech designs, well handled by experienced German crews, were able to take on most Russian tanks during the first months of the war. However, the introduction of the Soviet medium T-34 and the heavy KV tanks showed that the 38(t) was no longer a viable armored fighting vehicle. Still, the Germans tried to keep the tank in action by replacing its armament with a German 75mm L/48 gun housed in a PzKpfw IV turret. This attempt failed because the 38(t) body was too light to carry the new turret. The Model G was put into limited production in mid-1943. Its 50mm armor covering was put in place by welding, not riveting, but it was decided that the model was still too lightly armored and only about 47 were created. The Germans were determined to retain at least the chassis, and a light reconnaissance vehicle was produced, but this model was discontinued in 1943 after only 70 were made. Old 38(t)s were then stripped of their turrets and the bodies used as ammunition carriers, tractors, and smokescreen layers. The German Army then decided to use the easily maintained 38(t) chassis for a new set of self-propelled antitank weapons. The Czech design would become a gun carriage. First came the Panzerjäger 38(t) or Sd Kfz 139, popularly referred to as the Marder, mounting a 76mm antitank gun. Built in July 1942, the Marder saw service in both Russia and North Africa. Total production numbered 344. Another in the Marder series, the Sd Kfz 138, mounted a 75mm antitank gun. About 242 were made during the war and served in North Africa, Russia, and Italy. The 38(t) chassis was also used in the construction of mobile heavy artillery in the form of the Model H Sd Kfz 138/1 heavy infantry gun, called the Grille. Along with its sister type, Model K, over 370 were manufactured in 1943 and 1944. In 1943, the inspector general of Germany’s panzer forces, Generaloberst Heinz Guderian, stressed the need for a light tank destroyer. An order to produce the 38(t) chassis for a new self-propelled antitank gun to replace all existing mobile and towed antitank armament was issued. The result was the 75mm, 15-ton Jagdpanzer 38(t) or Hetzer. This new weapon was put into production in April 1944 and produced until 1945 by both Skoda and BMM. Between April 1944 and the following May, over 2,584 were built. The 75mm, 15-ton Jagdpanzer 38(t), or Hetzer, was issued to tank-hunter units beginning in July 1944. The Hetzer first saw action in July 1944 and was subsequently issued to tank-hunter units attached to all division-sized formations. Moving at 30 mph and protected by 60mm frontal and 20mm rear armor, the Hetzer was a dangerous adversary. The Hetzer was also manufactured in flamethrower, armored recovery, ammunition mover, and mobile heavy artillery carrier versions. With 1,168 38(t) tanks produced by the Germans from 1940 through 1942, and thousands of armored fighting vehicle variants based on the same Czech design, the Wehrmacht’s panzer and antitank capability was greatly aided and sustained not only in the heady years of conquest, but also during the grinding period of retreat and final defeat. Arnold Blumberg has been a regular contributor to WWII History’s sister publication, Military Heritage. He resides in Baltimore, Maryland. Tags Axis, Battle of France, Blitzkrieg, Czech Panzer 38(t), general heinz guderian, Generaloberst, Hetzer, Jagdpanzer, Munich Agreement, Nazi Germany, Netherlands, Panzer, Tanks, Turan I, wehrmacht.